* Colemans Cottage Fishery WL, Witham, Essex. Sun, 58, Wood, Pathfield and Stepfield lakes. Danny Mason (Bills Tackle) 87-0-0, waggler plus long pole and maggot, Wood peg 26; Paul Chambers (Browning Wickford) 84-0-0; Tom Wallis (Browning Wickford) 71-0-0; Martin Foster (Maver Image) 69-8-0; Steve Palmer (Tendring Tanglers) 63-12-0; Tony Martin (Colemans Cottage) and Charley Styles (Army) both 62-8-0. * Landsend WL, Landsend Fishery, Somerset. Sun, 36. Dave Hodgson (Landsend) 119-15-0, carp on pole and pellet, peg 34; Mike Duckett (Lands End) 90-14-0; Mark Poppleton (SW MG) 62-14-0; Ken Raynor (SWMG) 62-2-0; Steve Seagar (Maver) 57-14-0; Bob Gullick (Garbolino BVMG) 53-11-0. Silvers: Clint Wotlyla (Avon Angling) 18-6-0. League: Craig Edmunds (Avon Angling) 18 (242-6-0); Mark Poppleton 18 (195-4-0); Ken Raynor 17. * Maver Kent League, Frant Lakes, nr Tunbridge Wells, Kent. Sun, 36. Zak Brown (Preston Innovations Delcac) 92-12-0, carp, long poled pellet, Skirmish Lake; Cliff Prophet (Sensas South East) 55-2-0; Jim Sene (Maver Cardinals Red) 53-8-0; Bill Short (Sport One) 48-9-0; Ian Germaney (Maver Cardinals Red) 42-14-0; John Pantry (Sensas South East) 41-8-0. Teams: Sensas South East 33; Maver Cardinals Red 29; Preston Innovations Delcac 28; Maver Cardinals Black 23;Advanced Pole Repairs 22; Sport One 21. League: Sensas South East 228; Preston Innovations Delcac 194; Maver Cardinals Red 180; Advanced Pole Repairs 162; Maver Cardiinals Black 160; Sport One 141. * Ockendon Bait and Tackle, Puddledock Farm, Upminster, Essex. Sun, 53. Stewart Bracey (Shimano Dynamite Baits) 215-5-0, carp to 10 lb, bread across shallow, Snake peg 10, golden peg jackpot; Jason Collins (Browning Wickford) 129-2-0; Jay Martin (Dartford) 67-12-0; Mo Brown (Bowlers) 52-9-0; Brian Rowden (Andys Mob) 42-12-0; Dave Harold (Ockendon Bait and Tackle ) 39-0-0. * Rushmoor WL, Gold Valley, Ash, Hants. Sun, 50, Gold, Syndicate and Middle lakes. Myles Levy (Farnborough) 105-0-0, carp, bomb and corn; Paul Hiller (Daiwa Dorking) 93-4-0; Simon Kiefer (Drennan Bordon) 52-4-0; Pemb Wrighting (Daiwa Dorking) 46-0-0; Neil Gaff (Gold Valley) 44-0-0; Roger Beale (Farnborough) 39-10-0. Teams: Daiwa Dorking 41; Drennan Bordon 30; Farnborough 29; Gold Valley 21; Davies Angling 15. League: Daiwa Dorking 18; Farnborough 15; Drennan Bordon 12; Gold Valley 8; Davies Angling 7. * Tylers Common, Brentwood, Essex. Sat, 30. Glen Butler (Maver) 110-8-0, 45 carp to 5 lb plus silvers, pellet, Willow Lake peg 20; Steve James(Ockendon Bait and Tackle) 97-8-0; Jamie Mcquire (Rib Valley Angling) 83-4-0; Jim Wilson (Ockendon Bait and Tackle) 75-4-0; Jordon Briant (Maver) 68-10-0. * White Acres Silvers League, Pollawyn, Python, Trelawney, Jennys and Twin Oaks lakes, Kernow. Sun, 44. Harry Billing (Garbolino) 58-14-0, F1s, poled pellet, peg 18 Trelawney; Brett Nicholas (White Acres) 50-10-0; Chris Hancock (Sensas/Gwinear) 47-14-0; Stewart Lister (Spro) 48-8-0; John Danks (White Acres) 44-4-0; Andy Partridge (Spro) 42-4-0. * Wiltshire Angling Centre. Kennet and Avon Canal, Honeystreet, Wilts. Sun, 32. Alan Hillier (Sensas Wilts Angling) 9-0-0, roach and hybrids on bread plus three perch to 2 lb on worm, peg 1 at Sawmills; Kev Rowles (Devizes MG) 7-1-0; Simon Hebditch (Garbolino BVMG) 6-14-0; James Carty (Devizes MG) 6-11-0; Nicky Johns (Maver Bathampton) 6-7-0; Rob Kepner (Devizes MG) 5-15-0. 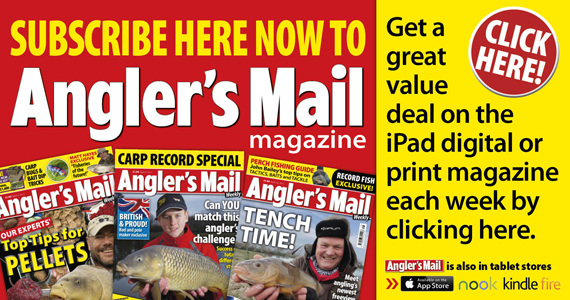 See the latest Angler’s Mail Preston Innovations Matchman of the Year table in this week’s issue, on sale Tuesday, January 28. Alders Farm, Aylesbury, Bucks. Sun, 26, Ash & Oak lakes. Mick Wooding (Rushden Angling Centre) 120-2-0, carp to 6 lb, pellet feeder and boilies, Ash peg 32; Terry Lancaster (GOT Baits) 94-3-0; Mick McMillan (Preston Innovations Delcac) 84-8-0; Andy Gregory (Drennan Bordon) 77-0-0; Richard Fulham (GOT Baits) 75-1-0; Gary Thorpe (Chiltern GOT Baits) 61-1-0. Bait-Tech Viaduct, Somerton, Somerset. Wed, 22, silvers. Spring and Middle lakes. Vince Brown (Mosella) 42-3-0, skimmers, long poled caster and maggot over groundbait, peg 3 Spring; Tom Thick (Thatchers Tackle) 37-12-0; Mark Harper (Preston Innovations Thatchers) 37-7-0; Sam Powell (Tackle Trader) 31-13-0; Dave Roper (Reids Tackle) 29-13-0; Andy Power (Preston Innovations Thatchers) 28-3-0. Sat, 15, Cary. Roland Lucas (Wilts AC) 136-8-0, carp, bomb and meat, peg 86; Steve Denmead (Keyfords) 89-0-0; Alan Oram (Shimano Dynamite Baits) 60-9-0; Ashley Tompkins (Tackle UK) 59-14-0. Silvers: Gary Webber (Preston Innovations Thatchers) 17-11-0. Bathampton AA Veals Silverfish Champs, Withy Pool, Hunstrete fishery, Somerset. Thurs, 27. Paul Dicks (Bristol) 18-4-0, skimmers, pole and maggot, peg 47; Barry Fitchew (Mosella) 8-4-0; John Fry (Bristol) 7-12-0; Dave Poole (Bristol) 6-0-0; Ray Bazeley (Bristol) 5-8-0; Mike Owens (Sensas Thyers) 4-7-0. BK Fisheries Winter Pairs, St. Erth, Cornwall. Sun, 14, Billy’s Pool. Bill Knott (BK Fisheries) 100-6-0, carp to 6 lb, 8 mm pellet down edge, peg 23; Sam Bawden (BK Fisheries) 63-4-0; Alex Bradley (BK Fisheries) 62-9-0; Adrian Holland (BK Fisheries) 56-10-0; Boz Phillips (BK Fisheries) 39-2-0. League: Bill Knott and Sam Bawden both 42. Colemans Cottage, Witham, Essex. Tues, 23. Cliff Adams (Browning Wickford) 107-0-0, Wood Lake peg 26; Jim Dodkins (Colemans) 81-0-0; Rav Pisano (Galleywood Social) 79-0-0; Jim Trew (Matchpack/Colemans Bait and Tackle) 69-0-0. Sat, 11.Jeff Church (Colemans Bait and Tackle) 89-8-0, Stepfield peg 40; Cliff Adams (Browning Wickford) 83-0-0; Steve Daniels (Preston Innovations Delcac) 83-0-0; Alan Lee (Bills Tackle) 71-0-0. Framfield Park, Sussex. Wed, 19, Spring Lake. Nigel Greenwood (Sensas South East) 74-6-0, all carp, maggot and pellet at 10m, peg 31; Lee Perry (Framfield) 50-1-0; Bruce Scott (Hemmings Tackle) 45-9-0; Mark Parrett (Faulkners) 41-1-0; Dennis Cooper (Rudgewick) 39-3-0; Lou Nightingale (Wylands) 37-4-0. Hackbridge AC, Furnace lakes, Sussex. Sun, 14. Mark Hathaway (Leatherhead AC) 15-6-0, skimmers, feedered maggots; Dave Johnson (Hackbridge AC) 9-14-0; Brian Wallin (Free Spirit) 9-0-0. Iden Wood Fishery, nr Rye, East Sussex. Sun, 10, Match Lake. Jamie Ford (Iden Wood) 42-8-0, carp, feedered maggot tight to island, peg 26; Andy Milton (Tackle and Gun Tenterden) 35-0-0; Paul Edwards (Iden Wood Fishery) 11-0-0. Ilminster AA VES Precision League, Dillington Pond, Somerset. Sun, 8. Jamie Rich (Against Men and Fish/Burts Baits) 11-5-0, roach and rudd, poled maggot and caster, peg 4; Scott Russell (Tackle UK) 9-3-0; Justin Charles (Ilminster AA) 7-6-0. League: Graham Field (Taunton) 9; Jamie Rich and Pete Lowton (Ilminster AA) both 10. Marazion AC, St Erth Pool, Cornwall. Sun, 6. Barry Little (Marazion AC) 26-13-0, carp, groundbait feeder and maggot, peg 9; Clive Lewis (Marazion AC) 25-1-0. MBK Leisures, Coloured Ponds, Rake, Sussex, Thurs, 6. Shaun Barnett (Drennan Bordon) 68-0-0, carp, poled pellet, peg 1; Dave Steer (MBK Leisures) 44-0-0. Monk Lakes, Staplehurst, Kent. Sat, 15, Puma Lake, silverfish. 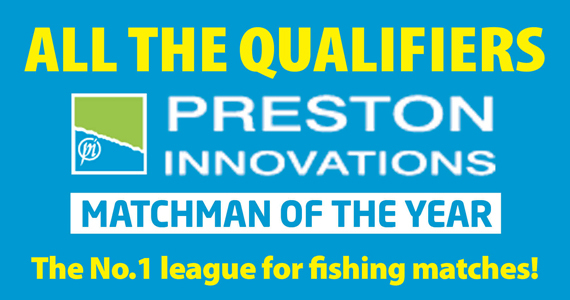 Sean Clifford (Preston Innovations Delcac) 25-0-0, skimmers and tench, poled pellet, peg 10; Pete Goodman (Preston Innovations Delcac) 22-0-0; John Larraman (Preston Innovations Delcac) 21-2-0; Sun Phung (Redbridge) 19-0-0. Sun, 19, Lake Two. Tony Flint (Willinghurst) 82-0-0, carp and F1s, Method feeder, peg 45; Peter Kay (Drennan Borden) 70-0-0; Paul Wiltshire (Maver Cardinals) 51-8-0; Terry Molloy (Garbolino Banstead) 51-6-0; Graham Offen (Willingshurst) 42-0-0; Rob Harvey (Milo) 40-0-0. Shiplate Farm, Weston, Somerset. Sun, 24, Hawthorn and Westpool. Alan Healey (Shiplate) 42-13-0, carp, poled bread and maggot shallow, peg 5 Westpool; Steve Howell (Shiplate) 37-4-0; Dean Malin (Shimano Dynamite Baits) 28-12-0; Dave Cockayne (Shiplate) 28-9-0; Tom Light (Shiplate) 23-14-0; Rich Hawkins (Shiplate) 22-9-0. Silvers: Julian Pinkett (Bristol PO) 7-10-0. Sonubaits Passies Silverfish League, Passies Ponds, Lancing, West Sussex. Sun, 24, Main Lake. Andy Carrington (Sonubaits Passies) 25-5-0, bream and skimmers, short poled pellet and Method feeder, peg 3; John Clark 23-14-0; Jason Kirk 22-14-0; Ritchie Kirk 22-4-0 (all Arun Angling). League: Andy Carrington (Sonubaits Passies) 2; Jason Kirk (Arun Angling) 3; Ritchie Kirk (Arun Angling) and Dave Lewis (Drennan Borden) both 4. Tillingbourne, Gomshall, Surrey. Tues, 15, over-50s. Brian Green (Feltham AC) 21-0-0, carp, poled corn; Dave Steer (MBK) 21-0-0; Pete Mason (Feltham AC) 18-2-0. Westerleigh WL, Westerleigh Pools, Avon. Sun, 15. Ryan Shipp (Westerleigh) 14-8-0, two carp and four F1s, poled maggot and pinkies, peg 24; Brian Shanks (Avon Angling) 10-2-0; Simon Belcham (Westerleigh) 6-6-0; Clive Feddery (Westerleigh) 5-10-0; Ron Hardiman (Westerleigh) 3-8-0; Bela Bakos (Silverfox) 3-2-0. Silvers: Brian Shanks 10-2-0. White Acres Midweek Silverfish League, Python Pool, White Cross, Cornwall. Wed, 12. Roy Booth (Barns) 24-8-0, roach, skimmers and F1s, feeder and pole with maggot, peg 15; Andy Partridge (Spro) 23-0-0; Chris Hancock (Sensas/Gwinear) 21-8-0; Pete Byrne (Gwinear) 19-4-0; Stu Lister (Spro) 19-1-0; Mark Layzell (White Acres) 14-10-0. Willow Park, Ash, Hants. Wed, 16, over-50s, Middle Lake. Chris Love (Willow Park) 32-4-0, carp, poled pellets; Eddie Rippon (Willow Park) 18-9-0; Jim Finley (Surrey Police) 18-8-0. Fri, 7, over-50s, Small Lake. Ian Turner (Farnham Angling) 53-8-0, carp, wagglered pellets. Sat, 20, WL, Small and Middle lakes. Doug Graves (Willow Black) 69-0-0, carp, poled bread and pellets; Mark Burroughs (Section 8) 39-4-0; Chris Love (Willow Black) 37-10-0; Dave Lewis (Drennan Bordon Youth) 27-12-0. Teams: Willow Black 21; Section 8 18; Drennan Bordon Youth 18. League: Drennan Bordon Youth 109; Willow Black 93; Section 8 89. Wylands, Battle, East Sussex. Sun, 11, Field Lake. Danny Wynne (Apollo) 41-3-0, carp, poled maggot, peg 9; Mick Wells (Sensas South East) 37-12-0; Ron Newman (Wylands) 29-12-0; Lou Nightingale (Wylands) 23-0-0.